Hot, fried, buttery, succulent, tender pieces of crispy bits of ecstasy. Hooters, watch out! Wing Stop, fall back! And Pizza Hut, please move to the left, to the left. 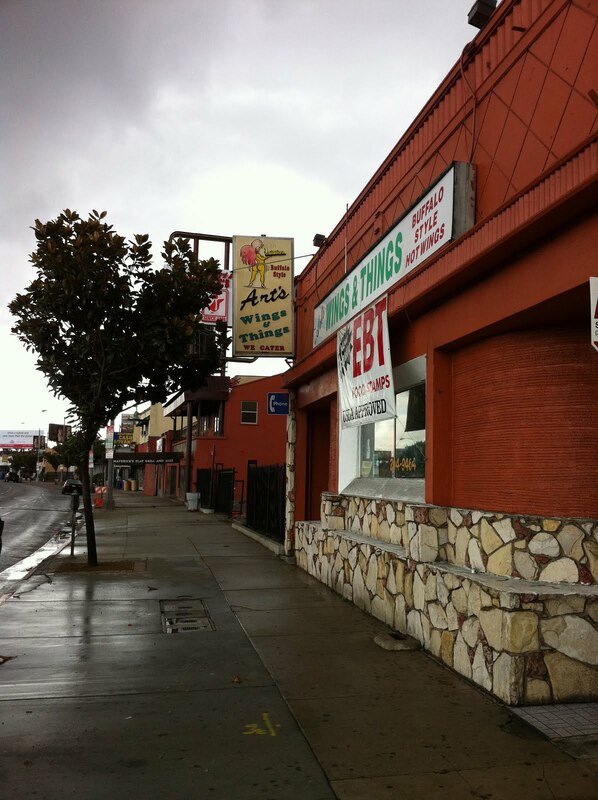 When it comes to L.A.’s best, most tastiest Buffalo wings, Art’s Wings & Things trumps all other establishments. Might I even say that these wings are not only the best in the city, but maybe even the state and possibly even the nation. Several key factors mesh together to create memorable wings. First off, it’s the chicken. Tender, juicy and quite flavorful. Not to fail to mention, these wings are also well-sized. These suckers don't look as if they were picked from any scrawny, malnourished, under-fed chickens. Secondly, the skin is perfectly fried so that after the coat of Buffalo sauce has been applied, it still retains its crispiness, never becoming too soggy or mushy. I must also note how delicious the Buffalo sauce is. You know how some sauces are so spicy that you can only taste fiery peppers, and nothing else? Well that’s not the case with this sauce. While it has a nice bite to it, it also still retains a zesty, remarkable flavor. In fact, as I think about it more and more, I’d say it’s probably Art’s sauce that truly makes these wings such winners. All wings are accompanied by triangle slices of wheat bread and fresh carrots and celery at no additional cost, but I suggest throwing in a bag of fries. They are magically delicious. Thin, golden brown and seasoned with salt and pepper. Now, I have to offer a few…“tips”…because I wouldn’t be doing my rightful duty if I didn’t share my “insider’s insight.” But please, don’t let the following deter you from stopping by - simply take it with a grain of salt! Please come prepared to pay in cash (or EBT). No credit cards accepted. I always, always, always call in advance to place my order and I always, always, always request my food to go. It’s not that I don’t want to wait and/or eat in the dining room – after all, the artistic murals of celebrities are captivating – it’s just that I can only look at Stevie Wonder and Prince so many times. And when you do call in and the lady who answers says that she’ll call you back immediately to confirm your order, and ten minutes passes by and you still haven’t heard from her, don’t fret. Calmly call her back and remind her to please place your order, and everything will be all good. With all of this said, do keep Art’s Wings & Things in mind, especially with this sports season in full effect. Just as there are football and basketball games to be watched, there are savory snacks to be consumed. So the next time you’re about to spend your Sunday perched in front of ESPN, pick of a box of wings – you won’t be disappointed!